Researchers at the Institute for Sustainable Energy at the University of Calgary in Canada are developing a method for capturing carbon dioxide directly out of the air. Capturing the gas from the air is the only way to collect gases generated by diffuse sources like automobiles and airplanes. Emissions from these vehicles represent approximately half of the greenhouse gases on the planet and this new technique could significantly reduce the level of these gases. Climate change scientist David W. Keith and his colleagues are building a simple machine from near commercial parts capable of capturing the trace amounts of carbon dioxide present in the air at any given spot. The local air mixture in non-industrial spaces is typically on the order of 0.04%. Traditional methods of carbon dioxide capture used in industrial spaces such as power plants are technically difficult even when the gas composes as much as 10% of the air and only handle the emissions created by the power source they serve. The proposed devices, usually called ambient air scrubbers, consist of capture towers containing sodium hydroxide (also called caustic soda) that interacts with air blown into the tower. The sodium hydroxide bonds with the carbon dioxide, separating it from the air which harmlessly passes through the tower. The carbon dioxide is then pushed into storage facilities. The details of the storage facilities are still undetermined, but one possibility is piping the gas to the bottom of the ocean or into deep underground caverns. The ambient air scrubbers are based on technology first developed in the 1950s. However, Keith’s design is significantly more energy efficient and early tests show that the power needed for its operation only generates about 10% of the carbon dioxide it’s capable of capturing, leaving the remaining 90% of its capacity for additional air cleanup. An ambient air scrubber has several advantages. It doesn’t need to be tied directly to the sources of carbon dioxide to remove it or even located anywhere nearby. A scrubber in China would still clean the air over Europe or North America, so they can be located wherever construction and maintenance is least expensive and near the storage location for the recovered gas. 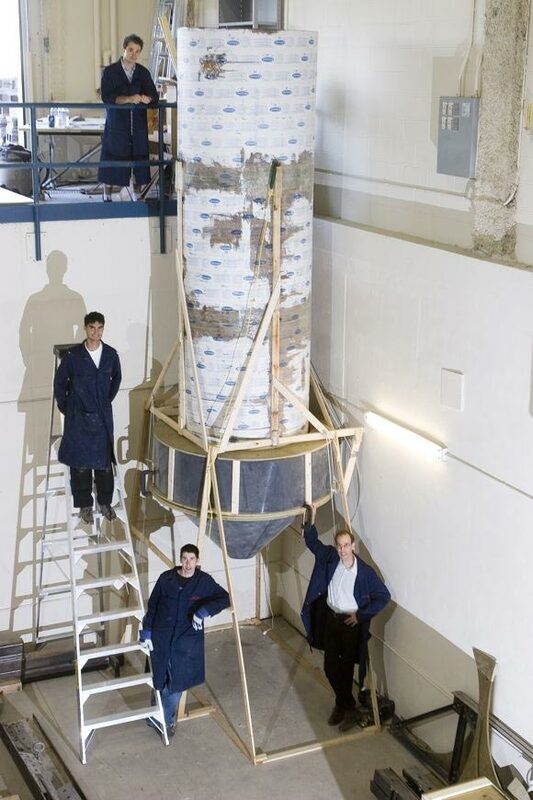 A seven meter test tower was constructed and tested at a University of Calgary sports stadium over summer 2008. Initial results look promising. TFOT has reported on other innovative methods for reducing carbon dioxide and other greenhouse gases, including a new material capable of absorbing the carbon dioxide emitted through coal-fired power plants, the Carbon Hero device that helps make people aware of their personal carbon footprints in the hopes that they will reduce them, and a church in Rome built with materials that oxidize carbon contaminants when exposed to UV light from the sun. 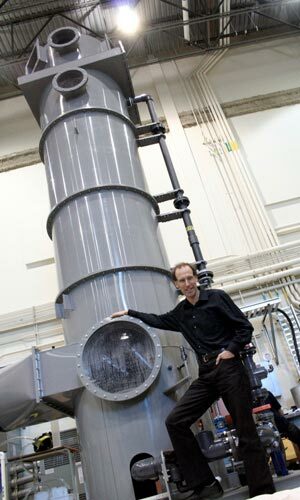 More about Keith’s ambient air scrubber can be found in the official University of Calgary press release and more technical information and a video of the air scrubber at work filmed for The Discovery Channel here.